Although this is the first day of winter, it's 56° F here after midnight! In the spirit and survival of wintertime, I'm going through the ritual of The Seed Catalog. Been dealing on and off since the 70's with Johnny's Selected Seeds. Seeds are almost as addicting as dry pigments. Here's the Brandywine heirloom tomato. 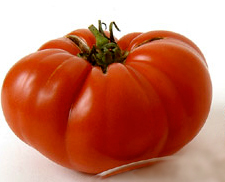 Reminds me of a tomato that might have been around in Melendez's time (Spain 1716-1795).